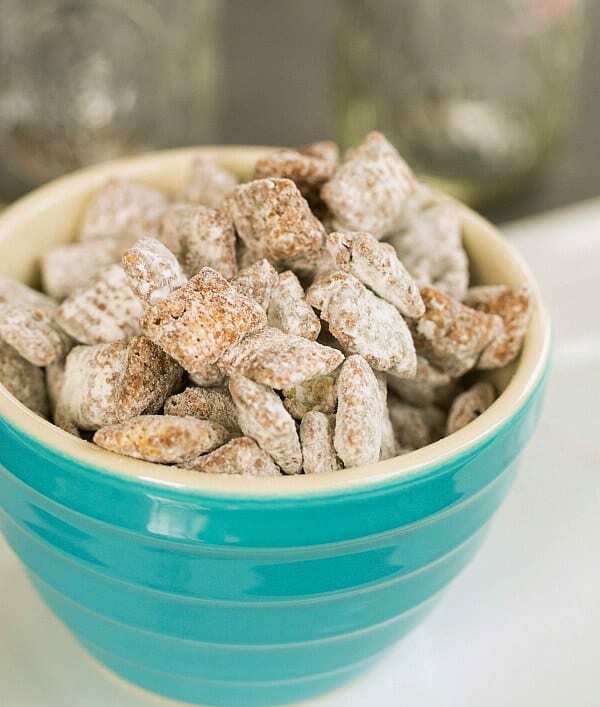 The first time I heard about this recipe, it was referred to as “puppy chow” and I absolutely thought that people were talking about a homemade dog food snack. 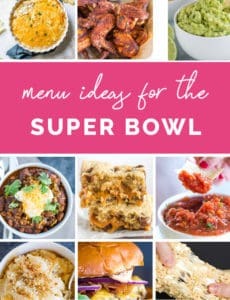 I soon found out that it was an alternative (and sometimes regional) name for what is more commonly known as Muddy Buddies – a super quick recipe made with Rice Chex cereal. The cereal is coated with a melted mixture of chocolate chips, butter, peanut butter and vanilla extract, then dusted with powdered sugar. Basically, it’s one of the most addicting snacks you’ll ever make. The fact that it can be thrown together in just 15 minutes is both wonderful and dangerous. If you ask me, it’s all sorts of wonderful. I’ve been making this concoction for years and just now realized that I hadn’t shared it with you yet! I did make a popcorn version a few years ago (“poppy chow“), which is amazing in it’s own right, but I couldn’t go another day depriving you of the cereal, chocolate, peanut butter and powdered sugar goodness. I love snacking on it in the evening while I watch TV; it’s a good dose of savory and sweet all-in-one. It’s great for parties, personal snacks and even to give as a gift. 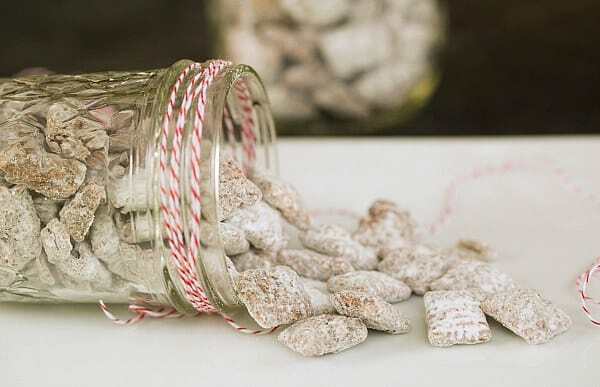 Fill some canning jars with the Muddy Buddies, tie a ribbon or some twine with a nice tag and you have a perfect gift for a hostess, a teacher, or anyone on your Christmas list. Chocolate and peanut butter-covered Rice Chex cereal, dusted in powdered sugar. A quick and easy snack! Place the Rice Chex cereal in a large bowl; set aside. 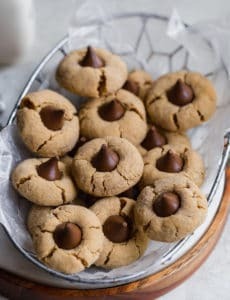 Place the chocolate chips, peanut butter, butter and vanilla extract in a medium bowl or 4-cup measuring cup. Microwave in 30-second intervals on 50% power, stirring after each, until the mixture is completely melted and smooth. 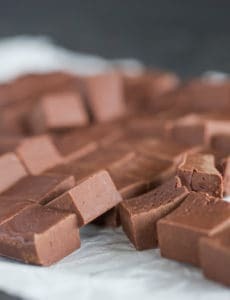 Pour the chocolate mixture over the Rice Chex cereal and use a rubber spatula to mix it until all of the cereal is coated. Place the powdered sugar in a gallon-size zip-top bag. Put all of the chocolate-covered cereal into the bag, zipper it closed, and then shake it very well until all of the cereal is coated with powdered sugar. Spread the mixture out onto a wax-paper lined sheet pan to cool and set, about 30 minutes, then store in an airtight container in the refrigerator for up to 2 weeks. What an easy and delicious treat! I made one batch subbing almond butter, and a second batch using peanut butter, white chocolate, and coconut oil – both were so good! I tasted this somewhere……somewhere? omg I can’t remember where……all I can think about is when that wonderful sensation of powdered sugar and then everything else follows. I have everything to make except rice chex and will pick them up today. I know what I will be munching on tonight as I watch Judge Judy primetime! Thanks for adding this link. I moved to Switzerland (originally from PGH :-) and my cereal options are really limited – i.e. no Chex. Is there a decent option other than Chex cereal? Would something like mini shredded wheat work? Thanks for your time! Hi Kate, Without knowing all that you have at your disposal, I’m not sure which would be the best option. I don’t know that shredded wheat would work; not sure that it would hold the coating. You could always try, though! I’m in France and I use golden grahams or the supermarket’s own variation of them. They taste best when you store them in the freezer. They are crunchier. My daughter (age 11) makes something like this but uses boxed cake mix to coat and there’s no peanut butter. She gives it out as a birthday treat to friends and family. I have also made it using Quaker oatmeal squares Which hold up better than any other cereal and is better for you with so much fiber. Very good and very messy. I’ve always called it Puppy Chow. Anyone that didn’t grow up in the Midwest look at you like you’re trying to feed them dog food… and then can’t stop themselves from eating the yummy goodness! Brownie Batter Puppy chow is the bestststststsest! 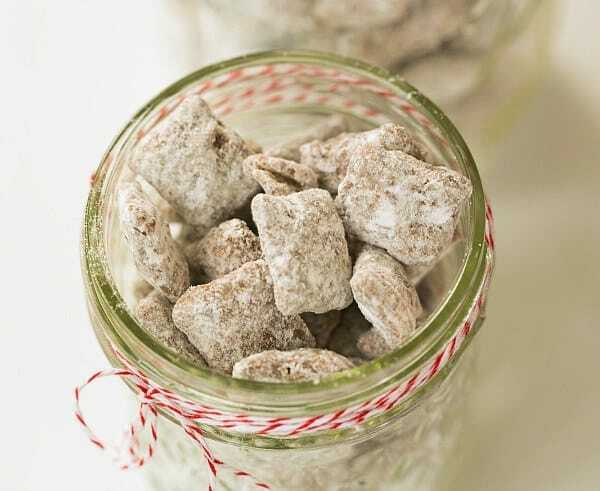 Puppy chow is the best. It’s so easy to make and give away to people. I have so many different versions on my blog. I like to up the pb, eliminate the butter, and use t less cereal so it’s more fully coated and has a lot of clumps. 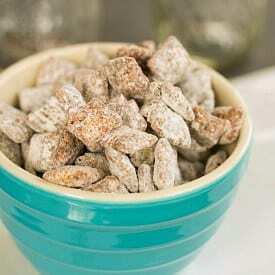 I’ve had this before, but never heard it called ‘Puppy Chow’… it was called ‘Trash’ because you used a (clean) trash bag to shake the bits around in to coat them in the powdered sugar. There was also a version of the same that used white chocolate, and that was called ‘White Trash’, LOL. I saw this and I was like, “Oh ho ho! I’m definitely checking this out! !” I love Muddy Buddies. And YES–they are definitely addicting. Thank you for not saving this recipe for December! I actually needed a quick snack for a visiting granddaughter yesterday! Success! It’s delicious! Thanks.